Does Brain Gym “make you tired”? Actually, no! I received this email from a woman who had just been in one of my Brain Gym® classes. She was a most enthusiastic participant and was truly looking forward to using what she'd learned, to support her students. and they have complained it makes them too tired. What can I do? First of all, I love it when my students write to me following a workshop or class. Sometimes they share surprising stories of changes they've seen right away with a particular child, or even with their whole class, and that's so delightful! But, honestly, I think my favorite emails are those with questions, because it means that person truly wants to understand more about this great work and how to put it to use. So I was excited to receive this email. In this case, though, I thought my reply might be helpful to more than just this one person. I'm sharing it here, with a few additions to complete my thoughts on this important topic. your challenge around this. It’s a question that’s come up before. really feel tired, or could it be that they feel relaxed? Give your students regular opportunities to experience different Brain Gym movements, really taking time to notice what the effects are. And keep in mind that they may notice different things on different days. 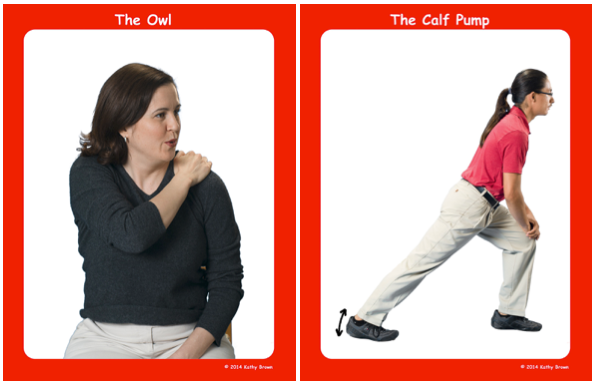 My own experience is that after doing Lengthening Activities, like the Owl or Calf Pump, I typically feel more alert and focused. After Midline Movements, like the Cross Crawl or the Double Doodle, I feel more ready for tasks such as reading or writing - and I'm better at them. And it’s often the Deepening Attitudes activities, Hook-ups and the Positive Points, that result in a greater feeling of calm presence. On the other hand, your students may truly be tired. (Changing circadian rhythms during the teenage years are often a culprit here, but that’s a whole different topic.) However — Brain Gym does not make people tired! What Brain Gym may do, is get people in touch with what’s really going on with their mind-body system, under all the “busy-ness” of their thinking and doing and hurrying through the day. Once the mind is more calm, and we’re more “present” in the moment, we can experience our more authentic inner state. Sometimes that means noticing the fatigue that was there all along. Students are not alone in this — we all may learn to ignore the fact that we’re tired. It’s often inconvenient, or not socially (or academically, or professionally) acceptable to stop and get the rest we need. Or people may have told us (especially when we were kids), "you don't get to be tired," or "no complaining, just get to work" — and that voice is still in our heads. Understanding oneself is a vitally important part of overall wellness! The more we understand ourselves, the more likely it is that we’ll be open to the cues of our mind-body system and do what’s in our own best good. That also means that we’re less likely to be led astray by the (potentially less healthy) influence of our peers. One more thought that comes up as I re-read your email: I sometimes feel tired after lunch, too — my body is busy digesting! Perhaps that could be one more aspect of your discussion. As a group, you could explore the movements, and see which ones help to bring a more alert state, even while digesting your lunch. It’s possible to digest, and have a balanced brain at the same time! I hope this helps. Please let me know if you try this new approach, and how it turns out! Does this information help you to understand your own experience of using the Brain Gym movements throughout the day? I'd love to hear what you have to share! You can refer to the book Brain Gym® Teacher's Edition for information on all 26 Brain Gym activities and their many benefits. In my book Educate Your Brain, pages 173-174 from the chapter titled “Brain Gym in the Classroom” offer some suggestions on how to introduce the concept of “noticing” to students. You can modify my suggested language to suit any age student you’re working with. Brain Gym® movement photographs Copyright© Laird Brown Photography. All rights reserved. ©Copyright 2018 Kathy Brown. All rights reserved. A Brain Gym® "Residency Day"
Over the years, I’ve had the opportunity to do Brain Gym® “Residency Days” at various schools. It’s very rewarding work. I developed the concept of “Residency Days” to offer schools a full day of direct student services, presentations, and/or demonstrating use of Brain Gym in classroom settings, though most are focused on direct student services – one-on-one "balance" sessions. Each Residency Day begins with a quick discussion with the principal or instruction specialist about the students on my list for the day, after which I set up my materials in the space provided. Then I go the classroom of my first student, check in quickly with his teacher, and walk with him to my work area. As we walk, I begin with a quick get-to-know-you conversation, eventually leading into a discussion of what the child wishes was easier about school. I explain a bit about the Brain Gym balance process, and support the child in selecting one specific area to focus on. Together we go through PACE, the four-step Brain Gym warm-up. Important note: I may not always take the time to express it this way in these brief descriptions of my student sessions, but each movement activity we do is something chosen by the student, from a “learning menu.” The child may either select it himself from a printed or illustrated page of options, or I’ll facilitate a “muscle check” (a kinesiology technique) to elicit a response from their mind-body system. Whatever the process, we move quickly but effectively through the balance session. My goal is to focus fully on each student and his balance, while holding the awareness that there are many students to see that day. I’ve found that it’s possible to see wonderful results with students, even though their sessions are relatively quick. The following are brief descriptions of sessions I did with seven children in a single Residency Day. Ernesto is in eighth grade and I was surprised to learn that he was reading on only a 2.8 grade level. His oral reading from a very simple Dr. Seuss book confirmed this. He stumbled and stumbled, miscalling several very basic words and ignoring the punctuation. After his learning menu (DLR plus Lazy 8s) Ernesto’s reading improved significantly. He read much more fluently, and when he made mistakes, he self-corrected. He often backed up to re-read sentences with feeling once he figured out the context, and commented on the rhyme of the lines: “That’s funny!” The humor had completely eluded him in his first reading, when he was just calling one word at a time. He was very pleased and said he’d like to come again. His reading teacher tells me that Ernesto now loves reading quiz questions out loud to his classmates – something very new for him. Curtis is a first grader who was not yet reading, despite much loving and careful attention from his teacher. The morning of his Brain Gym session he had been able to read only two of his eleven “practice words” for the week. We talked a bit about reading, and then went directly to his choice of the DLR process, after which his Cross Crawl was smooth and even. At this point he had to quickly leave, as it was lunch time. I learned later that when Curtis returned to his classroom he proudly and excitedly read nine of his eleven words! Warner is a seventh grader with many parent/home issues that have caused a lot of disruption in his life. He told me he was very good at reading words and sentences, but had a hard remembering what he’d read. He chose to read from the hardest book I had with me, an “adapted classics” collection of Sherlock Holmes stories, modified for middle school students. He read fluently, but remembered few details from the paragraphs he’d read. His learning menu called for the DLR process, after which he read again. This time his reading was even more fluent; he said he’d understood much better than the first time, and recalled every detail of those paragraphs. He said he was looking forward to his next reading comprehension test. Sanford is a fourth grader who’s having challenges with many aspects of school curriculum. He said he’d like most to improve in math. A pre-check showed that he knew few of his multiplication facts. As we did the PACE warm-up, it was clear that Sanford had significant issues calling on both sides of his brain at the same time, because even with repeated guidance he kept going back to a pattern of bringing his elbow to his “same-side” knee, rather than reaching for the opposite one. His balance called for DLR, plus The Double Doodle and Positive Points, after which he was still extremely awkward in doing Cross Crawl, consistently reaching for his same-side knee. He was happier about doing multiplication facts, and did a bit better, but I can see that Sanford will require more Brain Gym balances in order to improve significantly. Clara is struggling through first grade. She read to me from a very simple book for beginning readers and she did very poorly, consistently using picture clues to guess at the right word. I led her through the steps of DLR after which she read again. This time she looked only at the words as she read, sounding out many of words correctly, a few with a bit of help. Her teacher joined us at the end of the session and Clara read for her. The teacher said that she had never heard Clara really sound out words before, that she’d always guessed using clues from the pictures. By the time Clara finished reading for her teacher, she was easily reading or sounding out every word, reading with voice inflection and meaning. Martin is a third-grader who really wanted to improve his reading. He read aloud from a simple second-grade level book and basically read adequately, but not well. He didn’t stumble, but read slowly and carefully, without much expression. His learning menu called for DLR, followed by two of the many advanced Brain Gym processes: “Core Activation,” which activates the core muscles of the torso, and “Vision Re-Education,” a process that supports coordinated teaming and smooth tracking of eyes. When we completed this he read again – fluently, and with great ease and inflection. What a lovely, resonant voice! I suggested that he go right back to class and read for his teacher. At the end of the day I checked in with the teacher, who said the class had been working in such a focused way on math that she didn’t take time to hear Martin read. But she did notice that when she gave him a page of division problems that normally would have taken him an hour (with much resistance) that he was finished in ten minutes, with all correct but one. When she pointed out his one error, he nodded and said he saw exactly what he’d done wrong. Then she observed Martin happily reading to himself during the rest of math time. When I complete a balance with a student I typically ask, “Was it worth the time?” and students answer “YES!” My Residency Days at schools are very rewarding. It’s great to see students make such quick progress in academics and attitude! While you can see that not every Brain Gym balance does everything we’re looking for, the results often affect much more than the “target” issue, especially considering how much a student’s attitude improves when his or her academic abilities improve. My vision for our education system is to have a fully trained Brain Gym consultant on every school campus so he or she can do ongoing work just like this with students every day. Interested? The first step is taking Brain Gym® 101, where you learn to facilitate many kinds of Brain Gym balance processes, including Dennison Laterality Repatterning. If you'd like to take Brain Gym® 101, and live in Phoenix or want to visit, I have an upcoming course on November 10-11-12. Click here for course details! Brain Gym for a "Brand New Brain"
 The Brain Gym session process, known as the "balance" process, consists of five specific steps. I previously described this process in a blog article, which you can read by clicking here. I also describe the balance process in Chapter 12 of my book, Educate Your Brain. You can learn how to facilitate Brain Gym balances, and the Dennison Laterality Repatterning process, by taking the Brain Gym® 101 class. ©Copyright 2017 Kathy Brown.All rights reserved. Original article ©Copyright Kathy Brown 2002. All rights reserved. One of the wonderful things about Brain Gym®is that there are ways to use it creatively, in any setting, with all kinds of people, no matter what their “challenge” or “diagnosis” might be. Current books and articles on brain function are filled with the term “brain plasticity,” the capacity of regions of the brain to take on new roles. Brain plasticity may account for how recovery occurs following damage to the brain from accidents or stroke. I was interested to see what kinds of shifts Robert’s mind-body system would manifest following a Brain Gym balance. Robert and his wife arrived for the session, and we began with PACE, the Brain Gym warm-up. One element of PACE is to do the Cross Crawl. Robert did not have sufficient balance to accomplish the Cross Crawl while standing, so he learned and practiced this movement pattern while sitting on a chair. He had great difficulty bringing a hand to the opposite knee, indicating that his two brain hemispheres were not fluidly communicating with each other. I asked Robert which issue was the most important to address today, and he selected his “coat” issue. I had Robert act out the situation, to illustrate just how his challenge manifested. Standing at the coat rack, he held his coat in one hand and the hanger in the other, and looked at them. 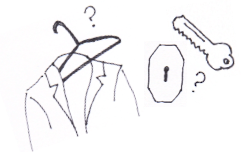 He easily put the hanger into one shoulder of the coat, but it took some processing to figure out how to get the other shoulder onto the hanger. Then he pointed to the coat rack rod and said, “Now, this is where I really have to think. See how the hanger tops are all lined up one way over the rod? I have to look at this hanger and be sure the top is curved the same direction as the others, so I can get it onto the rod.” I could only imagine how exhausting it would be to live each day with this kind of challenge. Robert's learning menu called for Dennison Laterality Repatterning (DLR), a process that supports the two brain hemispheres in communicating more fully with each other. At the end of this process, although he was still doing Cross Crawl sitting down, it was much more fluid – Robert's hand moved without hesitation to the opposite knee. When we returned to the coat rack, I handed Robert his coat and hanger. He slipped the coat onto the hanger and hung the hanger on the rod in the blink of an eye! You can imagine the surprised look on his face, and that of his wife! For this session, Robert’s learning menu called for an element from the Edu-K In-Depth material, a free movement/dance experience. We imagined gentle music playing, and his wife and I had a great time joining Robert in freely flowing around the room, moving in any way we would like. Then Robert was drawn to doing some simple Brain Gym movements. Because of my travel plans, I was unable to do more work with Robert. But he had made two huge shifts: understanding left and right, and knowing where the middle is. I left Robert and his wife with instructions on a variety of Brain Gym movements, and contact information for their nearest Brain Gym consultants. Robert’s wife later commented that these simple shifts and accompanying sense of ability had rippled out through all his daily activities, and brought him a long-awaited sense of accomplishment and peace. In my years as a Brain Gym consultant, I’ve dealt with many “firsts” with clients: all kinds of cognitive or academic issues, test or performance anxiety, fears and phobias, job or relationship challenges, and physical coordination issues (from tying shoes to piano or golf/skateboard/soccer performance). Every “first” shows me that, indeed, the balance process is a tool for every- one. The common denominator is that we all can create an intention for specific change and call on the intelligence of our mind-body system to choose a path to integration. The Cross Crawl is one of the Brain Gym “Midline Movements,” done by lifting one knee and then the other, alternating back and forth, each time bringing the opposite arm or elbow over to it. Learning Menu: The list of movements and processes from which the learner may choose, to facilitate their own learning. ©Copyright 2017 Kathy Brown. Sketches ©Copyright Kathy Brown. All rights reserved. Original article ©Copyright Kathy Brown 2007-2012. All rights reserved. The concept of "integrated low gear" is one of the most significant aspects of the learning process. I truly wish I'd understood more about it during my years as a classroom teacher. Do you remember your first attempts at something that required a lot of focus or coordination? Perhaps it was riding a bike: your first wobbly trials at simultaneous pedaling, steering, and balancing. Then, one day you found yourself simply riding down the road, thinking about something else entirely. You had mastered the skill of bike-riding and it didn’t require your focused attention anymore. I like to illustrate the ability to shift between integrated high gear and integrated low gear by thinking about traveling on holiday. Imagine you are driving through a part of the world you’ve always wanted to explore. You’re on the freeway (cruising) and you spot a little village in the distance, which you decide to visit. You certainly can’t cruise through it at freeway speed, so you exit on the appropriate off-ramp and find your way into town. You drive slowly, exploring all the charming buildings and shops. Perhaps you even park the car so you can get out and walk about on foot, to find that lovely café for lunch or afternoon tea, and purchase a remembrance or two. When you’re all finished with your exploration, you get back into your car and return to cruising on the freeway again, taking with you all that you learned about that picturesque place. This is the way true learning works: the learner moves seamlessly between integrated high gear and integrated low gear as needed. When reading, he can pause to figure out the meaning of a word and then return fluidly to the story. When learning a new mathematical algorithm, she can instantly call on the math facts she knows while taking time to figure out which numbers go where. This kind of processing calls on many different parts of the brain, which need to be ready to communicate with each other. 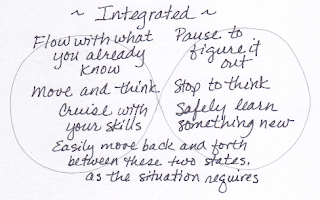 What happens when a child (or an adult) is not operating in an integrated state? He may end up moving compulsively: “Help! I can’t slow down!” This learner may miss details and produce poor or incomplete work, acting thoughtlessly and creating havoc in her surroundings. Or the learner may end up sitting listlessly: “Help! I can’t get moving!” He may start late and need prodding to finish; he may blend into the background or stare off into space. When these behaviors occur to a mild degree, they simply get in our way a bit, and we learn to manage them with compensations. But in the extreme, these are the very behaviors that could end up being labeled as ADHD (Attention Deficit Hyperactive Disorder) or ADD (Attention Deficit Disorder). It’s very important to be able to move effortlessly between integrated high gear and integrated low gear. Yes, it’s lovely to do things quickly—but integrated low gear is the only state where we can learn something new. 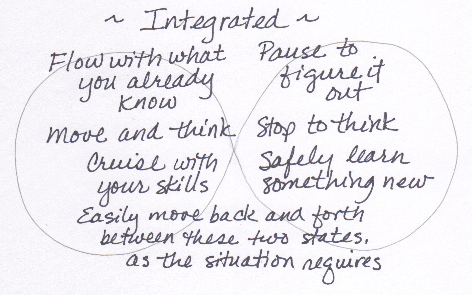 Without integrated low gear, we may careen anxiously through life “trying” to do things. In this state, we can’t slow down enough to do them thoroughly or accurately; we never have the satisfaction derived from small moments of accomplishment. Integrated low gear is a state that ideally emerges in childhood through the joy of discovery at our own pace. This kind of exploration occurs only in the absence of stress. It feels playful, emerges from curiosity, and is internally directed. Through it, we develop the qualities required for focus and sustained concentration. However, I believe that, when our initial exposure to a concept is stressful, we develop a fear-based reaction to it, leaving us unable to access our most integrated brain organization patterns. The Edu-K balance process offers us myriad possibilities for taking on new patterns of thought and movement. You may be relieved to know (as I was) that we can develop this internal pattern for integrated low gear (and its companion, integrated high gear) at any age, through Brain Gym balancing. Elsewhere in this book are stories of clients who were able to take on an entirely new pattern of thought or behavior as the result of a balance session. For example, there’s the story of Alexa, who couldn’t focus on the details of English grammar enough to study for a crucial exam. Once she had balanced to “easily understand and study English grammar,” she could focus on those details—and even found them interesting! Of all the elements of the Brain Gym program, I find that Dennison Laterality Repatterning (DLR) and Three Dimension Repatterning (3DR) are the most effective at supporting learners in developing both an integrated low gear and integrated high gear. These balance processes, developed by Paul Dennison, are what I call “the crown jewels of Brain Gym.” They can open the door to new possibilities in a most profound way. Meet Parker, a young client who was simply a small hurricane in tennis shoes. He was five years old and developmentally delayed, having missed a number of important neurological milestones. His mother, a physical therapist, had described to me some of his behavior and processing challenges, but nothing had quite prepared me for the way Parker hurtled into my office and set about seeing and touching everything. I began working very quickly and intuitively, and said, “Hey, Parker! Come lie down here on the carpet!” Parker’s mother, Cristy, had just taken the Brain Gym® 101 course, and I found myself saying, “Cristy, I think it’s time for a DLR with Parker!” She sat down with me to help with this process. There are five main steps of DLR, which involve various combinations of arm and leg movement, eye direction, and other elements in a specific sequence. Parker was able to do the first step fairly easily: it included the Cross Crawl, which Cristy had been helping him learn to do. This part of the repatterning process develops the integrated high-gear state of automatic movement. However, when it was time for Parker to do the second step, which included raising and lowering his same-side arm and leg simultaneously, he simply could not do it. This part of the repatterning process helps develop the integrated low-gear state: the ability to stop, think, and safely explore. Then it struck me—Parker was a whirlwind of activity, and he could not do this movement; it seemed he had no integrated low gear at all. He was incapable of slowing down! What would happen once this repatterning was complete? What would Parker be able to learn once he felt safe enough to explore at his own pace? Cristy and I carried on by “motoring” Parker through this movement; she’d raise his left arm and left leg together and lower them, then I’d raise his right arm and right leg together and lower them, back and forth, back and forth. Finally, Parker began participating in the process and started moving his arms and legs in that pattern on his own, first awkwardly and out of sync, then more fluidly. We completed the rest of the repatterning process in this same very simplified way, taking about fifteen minutes in all. When the process was complete, Parker rolled onto his side and curled up, very content. A feeling of serenity filled the air. My sense was that Parker’s body was absorbing this new experience of integration, and Cristy said that this was the longest she’d ever seen Parker be still when he wasn’t asleep. In addition, some other remarkable things were occurring. I mentioned above that Parker had struggled to achieve many basic infant skills, and one of them was nursing properly. As he lay there, he spontaneously began sucking motions with his mouth (which continued off and on for the next several days). Also, his next bathroom visit, a few minutes later, produced the first authentic, complete bowel movement of his life; Cristy said he’d never used the core muscles of his lower torso in that way before. These very basic steps are huge milestones in the life of a developmentally delayed child, and indicate that Parker had made several very important shifts through that very quick and spontaneous repatterning process. The next day, Parker went with his father to the shopping mall. Ordinarily, he would be “everywhere at once,” but on that day he stayed right by his father’s side, calmly looking at the things around him, despite the noise and distraction. This child, who had been stuck in the “Help! I can’t stop!” state, was now stopping, thinking, and choosing. After that one DLR, Parker was no longer living a life of such compulsive action, and he was finally able to process at his own pace. Since that time, Parker has continued to grow and change, making improvements in language expression, chewing, acceptance of new foods, tolerance of noise and disruption, auditory discrimination, and the ability to dress himself. He has also returned to some earlier developmental behaviors (the “clingy” stage of two-year-olds, for example). Cristy and I agree that he is spontaneously "backing up to move forward," this time completing each step more fully. Parker will certainly benefit from more sessions, but this beginning to his journey with Brain Gym balancing created a powerful foundation for future changes. Not every child has Parker’s extreme challenge with integrated low gear, but many children (and many adults) have this challenge to different degrees. Teachers describe with dismay the increasing number of children with impulsive behaviors, for whom it takes tremendous effort to sit still or keep their hands to themselves; prescriptions for ADHD medication are at an all-time high. As teachers and parents, it’s our responsibility to support learners in taking time to playfully explore so they can make the elements of any new concept their own. We validate slowing down by providing time for it and resisting the need to press for mastery right away. We also validate it by allowing ourselves to slow down, to enjoy the exploration, and model this for others as well. Articles abound on the speed of life today, reporting that many adults feel they are “spinning out of control.” How many of us are struggling in life and wish we could feel safe enough to simply pause and think? 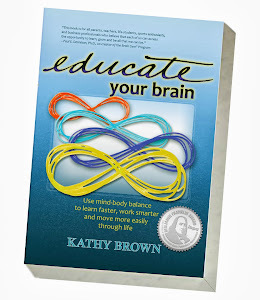 Brain Gym balancing is a wonderful support for anyone who wants to make this kind of change. Once we experience integrated low gear, we begin to know the joy (and relief!) of working at our own pace. Then our world offers new richness, new possibilities, and, most of all, choice. We can actually pause when appropriate and reconsider. This allows us to freely create and recreate how we move through our day—and our life. Brown, Kathy. Educate Your Brain. Phoenix: Balance Point Publishing LLC. 2012. 83-88. Original article ©Copyright Kathy Brown, 2005. All rights reserved.